Supports 25,000+ IC devices from 150+ IC manufacturers. FLASH memories, EPROMs, EEPROMs, Serial EEPROMs, FPGA Configuration Serial PROMs, NVRAMs, PLDs, CPLDs, EPLDs, Firmware HUBs, Microcontrollers, PICs, Standard Logics. Supports a wide variety of other IC packages with reliable factory-made adapters. Packages supported includes: PLCC, CLCC, SOIC, LAP, QFP, TQFP, VQFP, TSOP, TSOPII, SOP, PSOP, TSSOP, SON, EBGA, FBGA, VFBGA, µBGA, etc. Free software updates can be downloaded via Internet at any time. Very fast programming speed via USB interface. 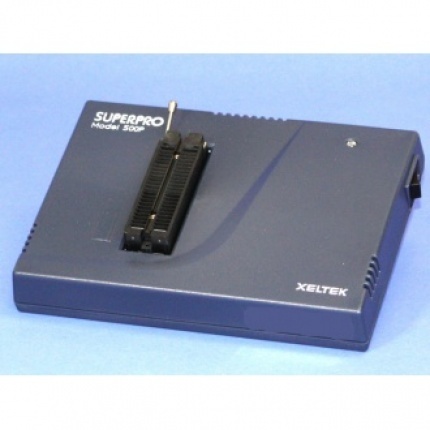 Programs and verifies a 64M-bit NOR flash memory device in 11.3 seconds and a 64Mb EEPROM in 43 seconds. The auto-start feature allows programming to start automatically as soon as a chip is inserted into the programming socket. The programming unit has 48 universal pin-drivers built-in. There is no need to add additional or optional pin-drivers for programming devices of up to 48-pins. Since each pin-driver is software programmable, proper voltage levels will be applied to each and every pin, not just the Vcc pins, allowing true low-voltage programming for low-voltage devices. Light-weight and portable, good for field applications and international travel (takes 110V to 240V AC). Programmer-control S/W is Windows XP and Vista compatible. Pin continuity and reverse insertion checks help to prevent devices from accidental damage. Over-current and over-voltage protection ensures safety of the devices and programmer hardware. Auto-program command combines device operations like program, verify, security into a single command at any user-selected sequence. Project function simplifies operations. Settings such as device selection, file selection, device configuration, program options can be saved into project files, thus reducing multiple steps into a single operation. Automatically recognizes file formats and detects large file offsets. EPROM, Paged EPROM, Parallel and Serial EEPROM, FPGA Configuration Serial PROM, FLASH Memory (NOR), EPLD, Firmware HUB, Microcontroller, Microchip PIC, etc. PLCC, JLCC, SOIC, QFP, TQFP, VQFP, PQFP, TSOP, TSOPII, SOP, SSOP, PSOP, TSSOP, SON, QFN, EBGA, FBGA, VFBGA, µBGA, CSP, SCSP, etc. Software and device algorithms are updated regularly. AC power supply: Input 100V-240V AC, 50/60 HZ. Gross shipping weight: 5 Lbs. 2-years. Programmer is warranted to be free of manufacturing or workmanship defects for two (2) years from the date of purchase. Warranty covers parts, labor, and free UPS ground shipping from Advin back to customer. (Free ground shipping applies to 48-states and Canada only). 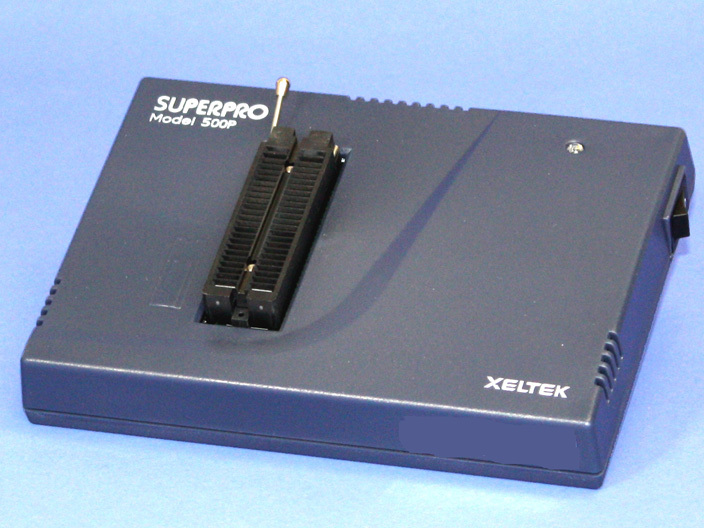 Programming unit with 48-pin DIP ZIF socket adapter. Registration card and user-feedback form.